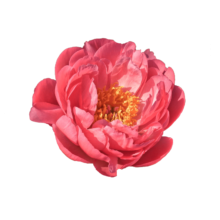 Coral peonies are known for blooming early in peony season and that’s certainly the case for Pink Hawaiian Coral. It’ll bloom well over a week earlier than its siblings. In contrast to the rest of the family, this peony variety does not turn to orange, but instead transforms from an intense coral colour to light pink. Pink Hawaiian Coral is an exotic open peony that really stands out in a summery bouquet because of its large flowers. Peony varieties with single and semi-double flowered forms – such as Pink Hawaiian Coral – evoke the feeling of youthfulness and frivolity that spring brings. The Klehm family are one of the earliest peony growers and joined the American Peony Society 1903, its year of establishment. Roy Klehm registered Pink Hawaiian Coral in 1981 and the peony won the coveted APS Gold Medal in the year 2000. Pink Hawaiian Coral opens explosively. This peony is at the right maturity when you can use your thumb to sweep the green bracts away and when the inside of the bud is showing a pink colour.